I’m taking this whole January thing pretty slow this year. The cool thing is that it seems like a lot of people in blog world have been in the same boat. But it’s January 28th, and I feel like if I’m gonna talk about goals and 2015, I better get on it. Last year I wrote a post about a renewed focus on fitness and finances. Rereading that post made me happy because when I think about it, there was a lot of progress made over the last year in those areas. I’m in a much better place attitude-wise when it comes to fitness, and we paid of my student debt last year and (cross your fingers) are hoping to buy a house early this spring. That actually wasn’t our intention when I wrote that post last year, and how we got there really deserves it’s own post. But either way, things are happening, we did more budgeting last year than we ever had before, and it appears to have paid off somewhat. I liked picking two themes to focus on and sticking with those. Since these are pretty broad topics, for now I’m just going to paint them with broad strokes. One of the things on my Wishlist for 26 was to creatively nurture relationships. My whole life I’ve watched my mom who is a total extrovert and seems to naturally stoke many relationships over time. She has a keen inner sense of when it’s been too long since she talked with a friend or family member, and then she’ll pick up the phone or text them, or whatever. I am seemingly not blessed with this skill. By the time I have that intuition that it’s been too long, it’s already, well, been too long. I’ve kind of been a hermit over the past few months, and I’d really like to get better by having some sort of accountability in my relationships other than the natural consequence of losing touch. Here’s my idea: I want to come up with some kind of goal-oriented system for staying in touch with the people who are important to us. I think it starts with making a list, and then tracking how often we keep in touch. Something simple. I’d been thinking about this for a while, but was really hesitant because I felt like doing this would be like admitting that I’m some kind of robot or social freak who can’t maintain relationships like a normal person. But while reading EntreLeadership (very slowly but surely) I read that Dave Ramsey and his wife set social goals for themselves each year, like a number of dinners that they’ll schedule with their friends. That sealed the deal for me. If this guy can write about how he does this in his book, then I can at least give it a try. Remember those broad strokes I talked about? I’m not really sure how to define this part. Everything about relationships that I wrote above kind of factors in here, but here are a few habits that I’m trying to instill that go under this category. I started journaling when I was 14 and was religious about it until I went to college. Every night, I would write. It’s something I’ve picked back up in the last month or so, and it’s been really good for me. There’s something comforting about unloading your mind onto paper before you go to sleep. I’ve noticed that it’s harder to fall asleep when we watch TV right before bed. I’d really like to start reading before I go to sleep every night, but it’s hard. I’m reading Yes Please right now, which I’m loving, but it’s taking me longer than I’d like to get into the routine. I’ve started setting my alarm for 7AM and putting it on the dresser across the room. So far, I’ve been pretty successful! I will say that I’ve learned that you can waste time at any hour, and I’ve learned how I don’t want to spend that morning time (it starts with “F” and ends in “book”) but I’m working on it. It’s a process. Ever since doing Whole30 last spring I’ve been thinking a lot about food and the impact it has on my well being. I’ve been thinking a lot about eating less sugar and crap, for lack of a better word, and decreasing meat and increasing vegetables in my diet. Notice how I said thinking and not doing. I’ve actually made a lot of progress on the vegetables in January (when you compare it to December, it’s hard not to) but I still have a ways to go to achieving the kind of balance that I’d like. Did you set any goals this year? Or maybe you had a different way of focusing your efforts for 2015? I’d love to hear about it! 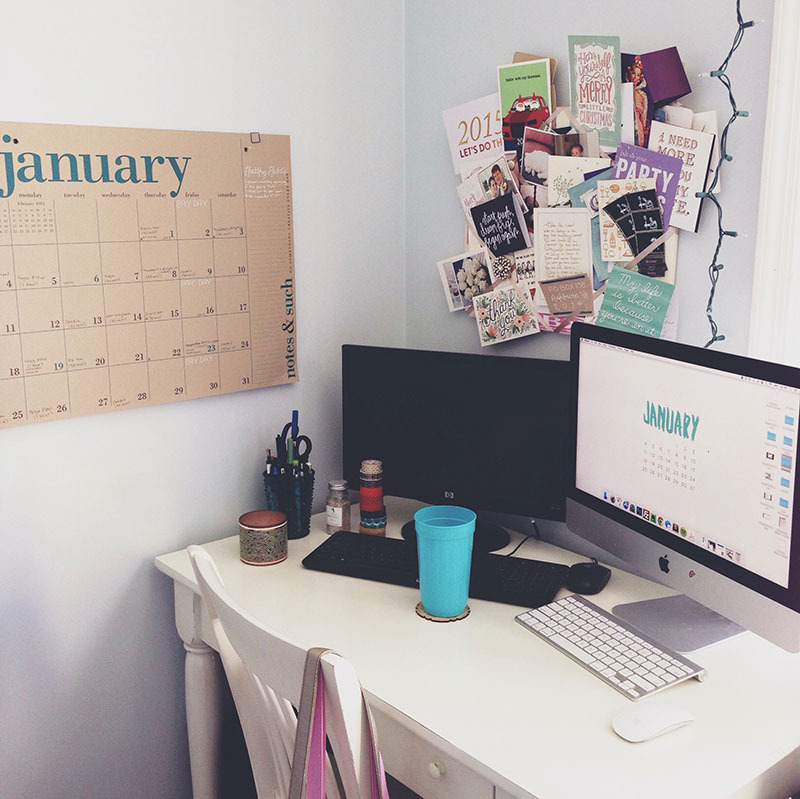 « Starting a new blog in 2015? I like your broad strokes approach. I also like how last year you focused on two things I think that is a good idea because you can focus. Sometimes I have so many resolutions that I am overwhelmed.